I first worked with Erised and Dan for their maternity session at the gardens location and loved photographing them again as a new family of three for Benicio’s newborn session. You can view their maternity session images by clicking here. Believe it or not, I still haven’t blogged his newborn session! I routinely photograph 20-30 clients per month, so I just don’t have enough space on the blog (or time to write them!) to feature every single session. When the family arrived at the studio for Benicio’s six month milestone session, I was so excited to see them! Erised is one of my favorite people and we always have a good time chatting. Benicio is one the HAPPIEST babies on the planet, and is absolutely adorable. It was so wonderful to see Erised and Dan as parents to an older baby and to see how they had acclimated so well to being parents. The first few months were challenging as they navigated sleep (isn’t that the case for so many of us?!) but with some experimenting with nap schedules and moving him to his nursery they finally experienced getting to sleep through the night! I still remember when all three of mine started sleeping through the night. It was such an amazing and strange experience to wake up that morning feeling completely well rested. If you’re expecting, people will try and scare you by telling you that you’ll never sleep again. Don’t listen to them. You will, in time! And someday, you’ll be the one dragging them out of bed in the morning. My oldest is 7, and I’m starting to experience the sleepy protest of “But Mom! I don’t WANNA wake up for school!” already. Erised had followed the style guide and had brought along several things for Benicio as options. She’s a fan of shopping at Baby Braithwaite here in Atlanta, and that’s where his sweet little knit blue rompers are from. Other great local options for unique baby and child clothing are Feather Baby in Decatur, Janie & Jack, Baby Gap, Baby Zara, and believe it or not - H&M! For the Southern mama, Feltman Brothers and Beaufort Bonnet Company have pieces with smocking and Peter Pan collars. 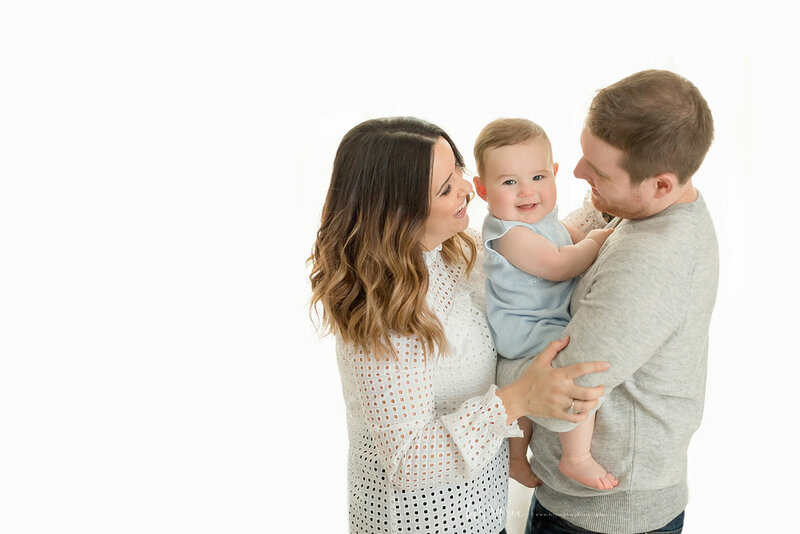 I typically start my milestone sessions with the entire family if the baby is experiencing shyness or stranger anxiety. Since Benicio wasn’t shy AT all, we started with solo portraits and then added parents and family into the mix. Milestone sessions are efficient because babies this age get tired out easily from stimulation, so I work quickly to make sure we have a varied gallery full of options! Benicio is such a chunky little guy, and Erised wanted to remember all his little rolls. In between outfit changes, we put on one of the studio cloth diapers over his regular diaper and photographed him in our Eames style chair. 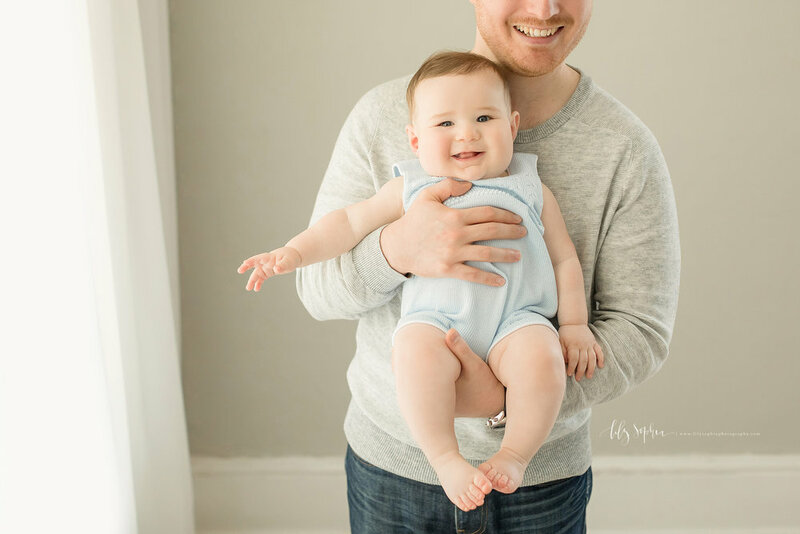 When babies see me throughout the year, I really love to use the Eames chair for a few images in each session so that you can see how much your child has grown in between their sessions. It’s really am amazing thing to see! I also want to note really quickly that when babies are in chairs and on the bed in my studio, mom or dad is right there next to them, just out of the frame. We take baby safety very seriously around here, and have measures in place with every session to ensure that! 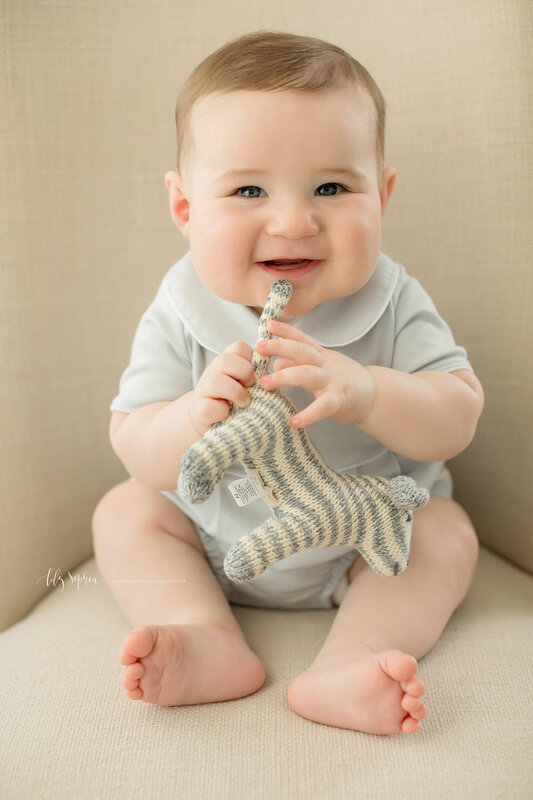 Isn’t Benicio just the most adorable blue eyed little guy?! I cannot wait to see him next month for his First Birthday session!